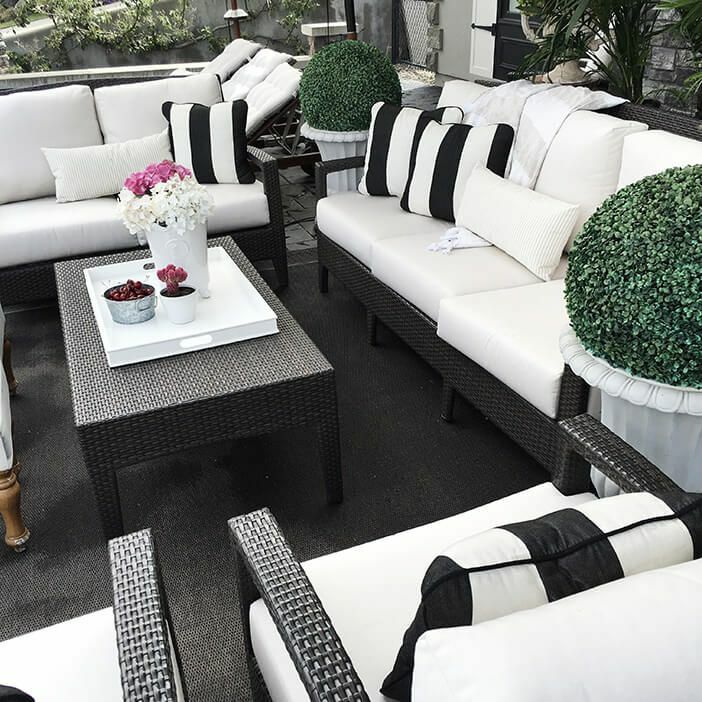 The Savannah Deep Seating Collection offers an entire grouping that can either be combined as a full set, or purchased individually. 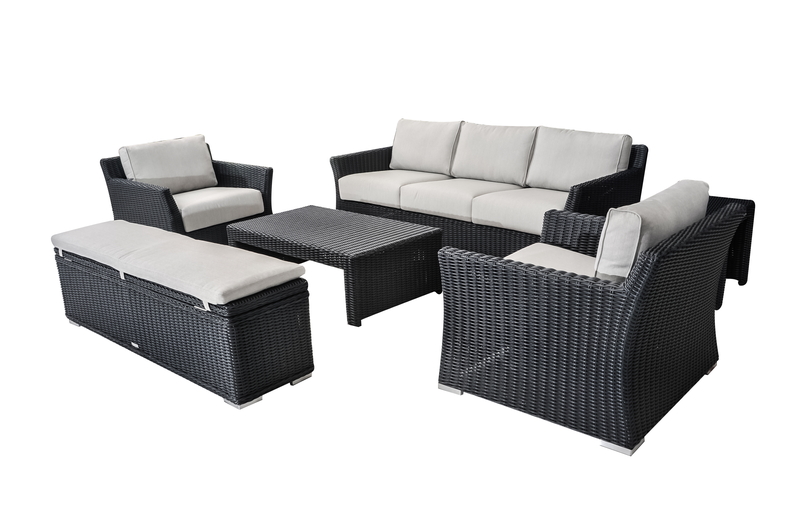 Made of three solid, reliable materials, the Aluminum and Synthetic Wicker Frames coupled with Olefin cushions help to ensure that the Savannah furniture pieces will last! Outfit your outdoor living space with this bold, modern collection that features a variety of items- including a bench with convenient, built-in storage! 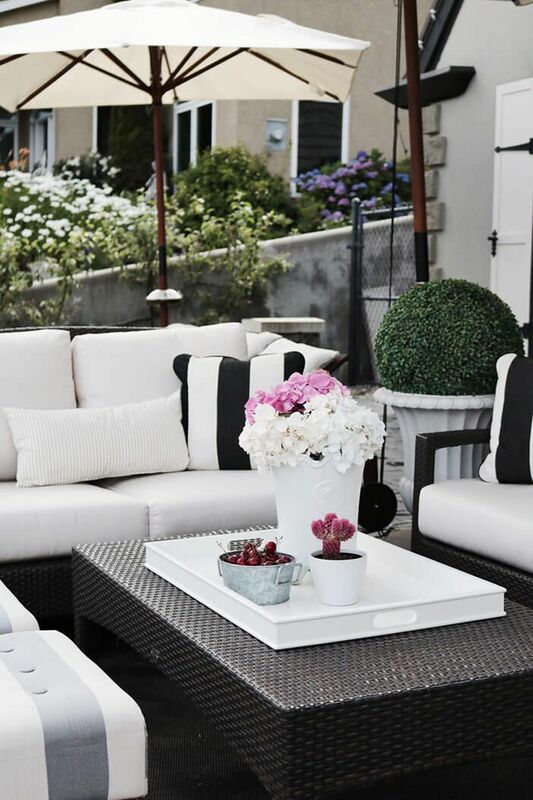 The beautiful contrast of the dark black frame with granite coloured cushion provides an elegant and neutral colour palette to add any toss pillows or knickknacks you desire. 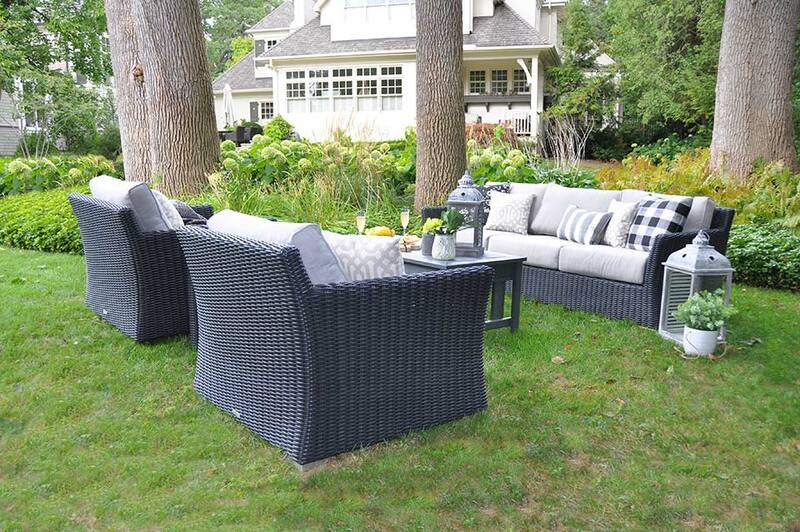 Create a true extension of your home with a living room style set-up in your backyard for primary entertaining needs. 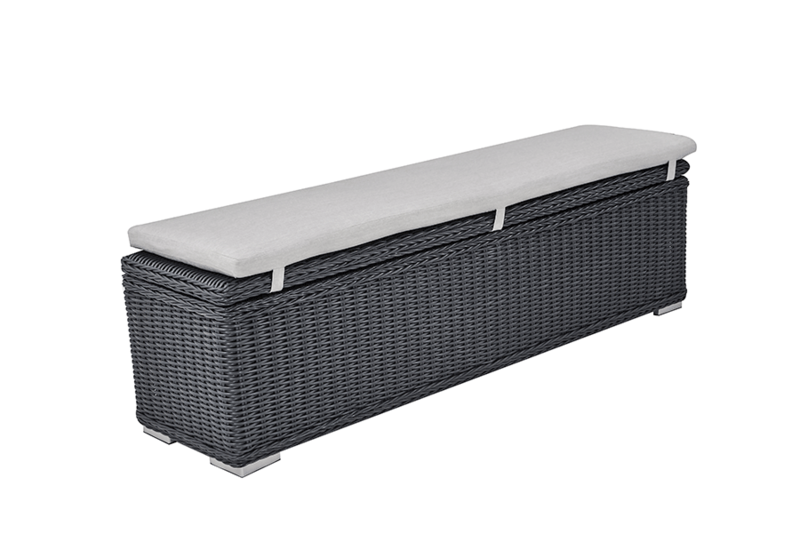 The Savannah Storage Bench combines the convenient and exclusive feature of adding extra seating to your deep seating space, while also providing easy storage. 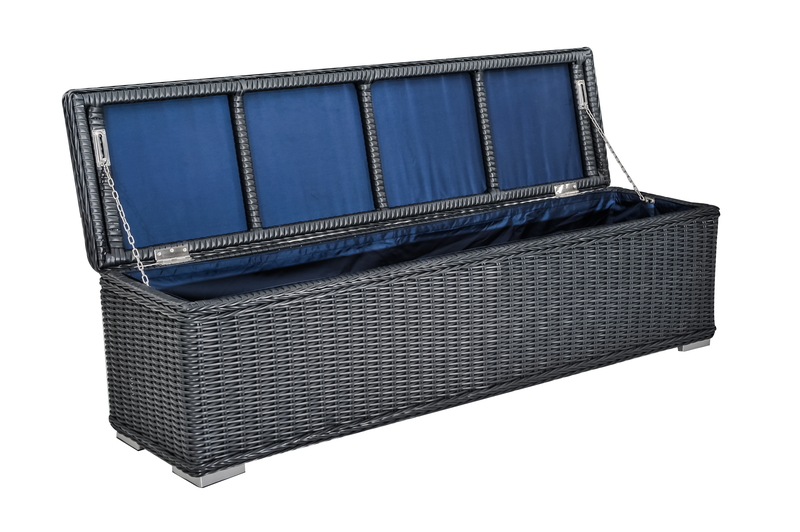 Keep pool toys, outdoor blankets and accessories at the ready for entertaining any time of the day. 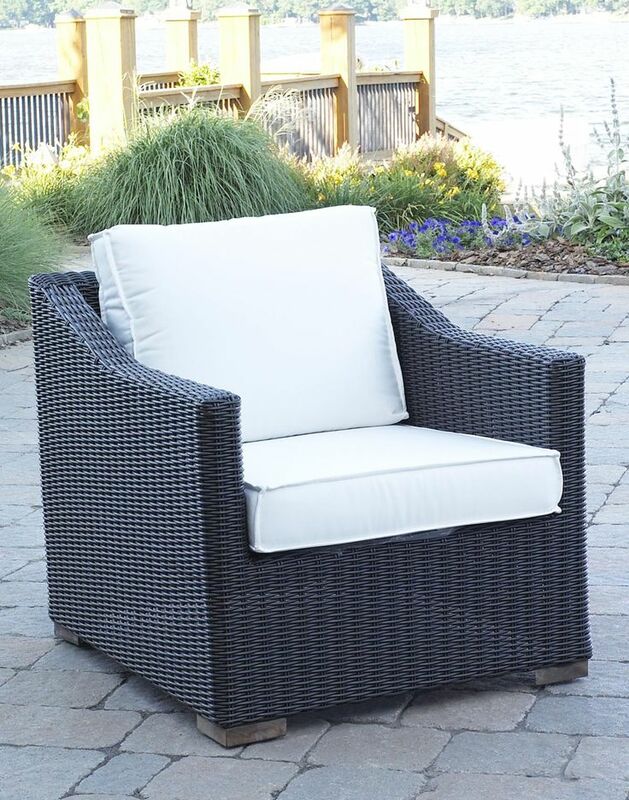 The Savannah Club Chair is a a large, wide chair suited for long hours of conversation and entertainment outdoors. 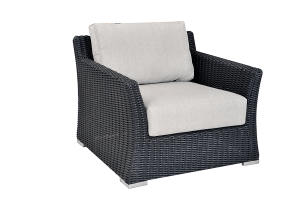 Furnished with a modern, synthetic wicker exterior and a grey Olefin cushion that is backed by a 2 year warranty for fade protection. 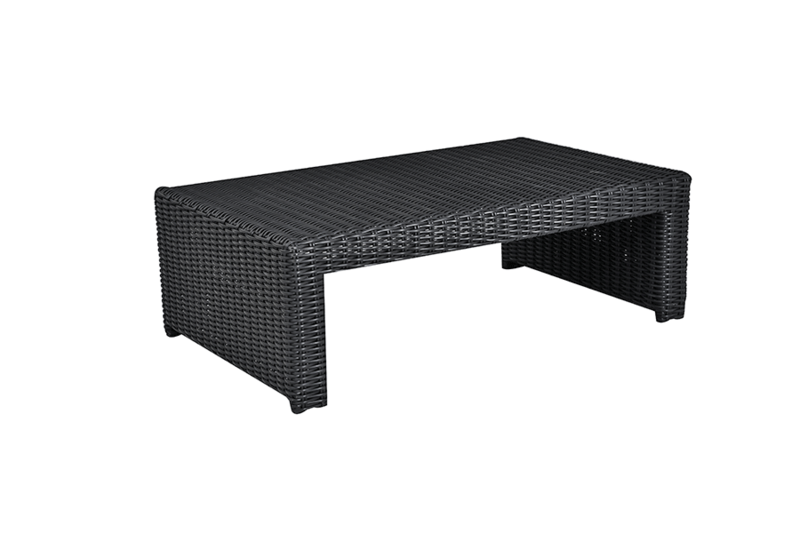 The Savannah Rectangle Coffee Table is made with an aluminum frame for strength, and wrapped by synthetic resin wicker for style. 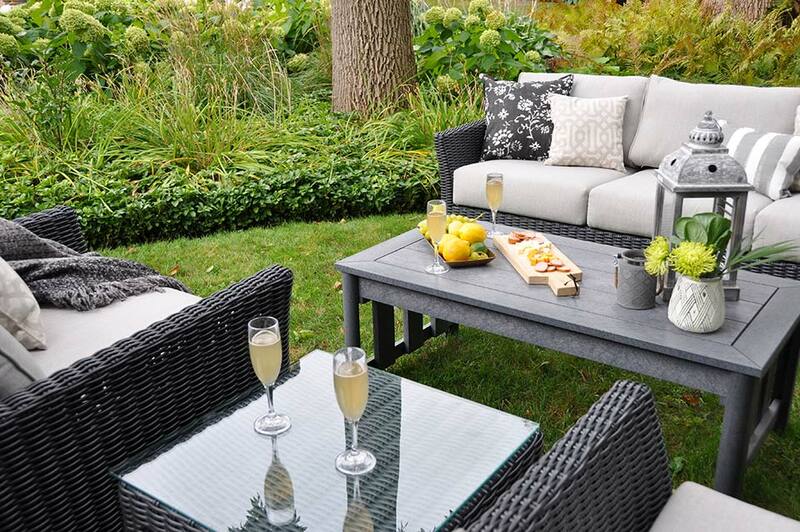 The tempered glass table top allows for easy, wipe-down cleaning. 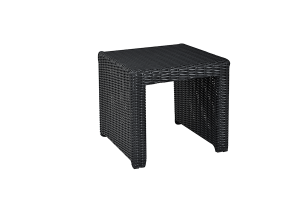 The Savannah resin wicker Side Table is made to match the full Savannah Collection and Coffee Table perfectly. Pair this between 2 Club Chairs for a place for family and friends to rest their drinks and engage in intimate conversation. 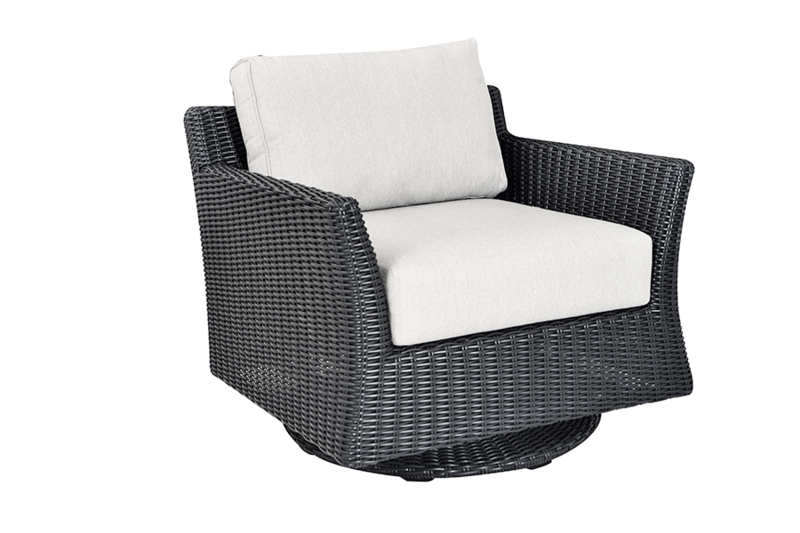 The Savannah Swivel Club Chair literally and figuratively adds a twist to your outdoor space! 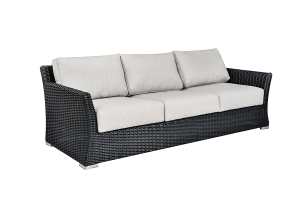 Enjoy this piece with the full Savannah Collection or on its own for optimal comfort. Made with synthetic resin wicker and Olefin Grade cushion included. 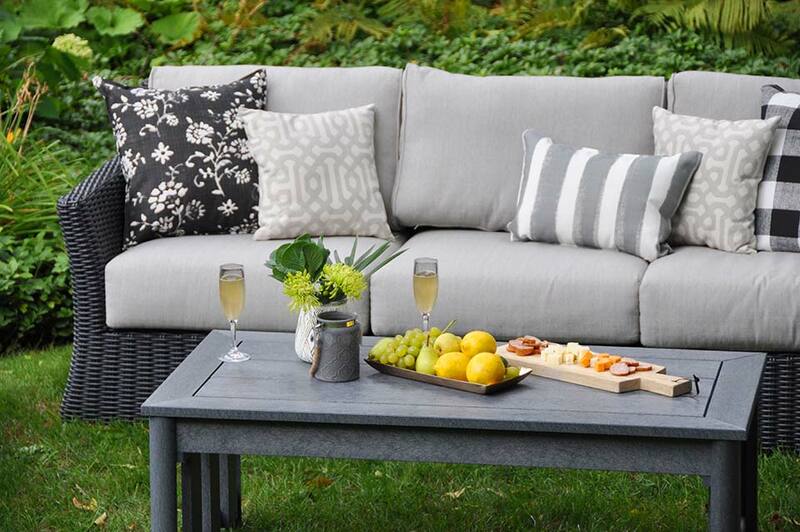 The Savannah Three Seat Sofa is perfect for outdoor, mid-naps and for maximizing your seating area. Seat 3-4 people comfortable on this large, deep couch and relax on thick, Olefin cushions that are made to withstand light rain and sun rays. 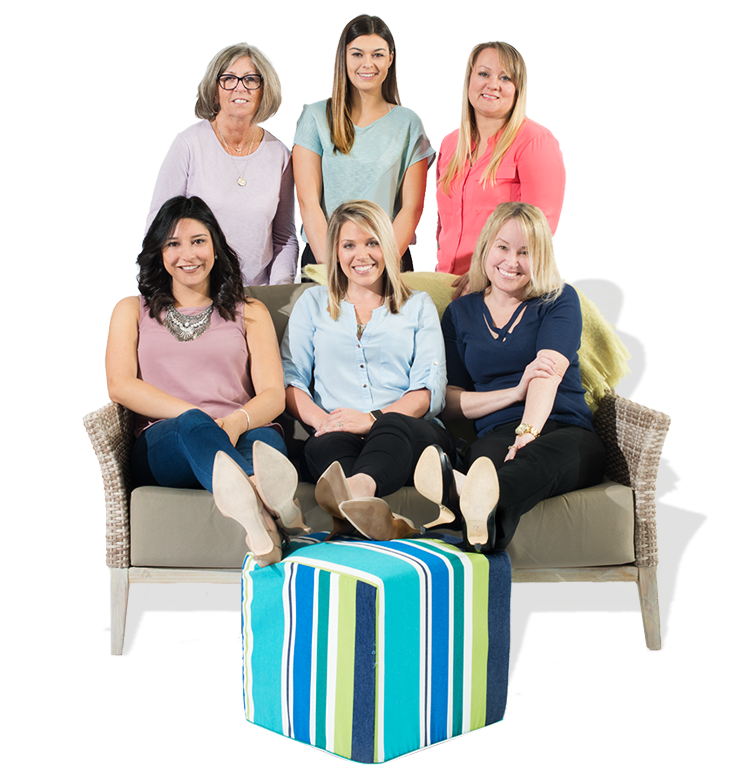 Backed by a 2 year warranty.